January 29, 2017 the Fashion stuff., the Hair stuff., the Makeup stuff. Our next stop during our 2017 awards season brings us here, to the red carpet of the Screen Actor’s Guild Awards. A glitzy red carpet feels strange and quite off at the moment considering the tumult of this past week, but I invite you to beat back against any frustration, despair, or anxiety you may be dealing with and just enjoy something frivolous and pretty. My dad frequently quotes Willy Wonka to me- “A little bit of nonsense now and then is cherished by the wisest men.” Let’s have some nonsense, if just a moment. And now, to summarize- I have so, so appreciated the noticeable amount of risk-taking and weird-making during this red carpet season. Gone are the column gowns! Out of sight are the solids! I am so pleased with all the sequins, patterns, appliqués, architectural designs, and animals that adorned this year’s SAG Awards’ gowns. It’s been a good year so far (in this realm, at least). I can’t wait for the Oscars. Let’s get started! This dress is sweet. It even has little bows! It’s girly and femme and frothy and magical. I love this dusty shade of mauve. Maybe it even has some purple in it? It’s hard to tell based on all the photos you see because the lighting is so different in nearly every one. But what I love about this overall look is that Taraji’s hair keeps this Reem Acra dress from drowning us in sugar. Taraji’s assymetrical bob with shaved sides is the lewk right now. I had this haircut for about six months (sans shaved sides) and it adds salt to everything you wear, seriously. Cookie got it done tonight. And her eyebrows are always fiyahhhh. In case you haven’t noticed, Natalie Portman is pregnant. She’s actually been pregnant during both of her special awards seasons (the previous being for Black Swan in 2011, for which she won a Best Actress Academy Award), and yet I’ve loved this go-round of maternity style so much more than her first. Of course it might be the constant Jackie O inspiration we’re seeing in her styling lately, but Natalie has looked so regal this month. She and her stylist Kate Young have chosen gowns that are the epitome of elegance and class. And a sidenote- statement sleeves like these are going to be major this spring, and the choice of white may have been a nod to suffragettes. What. A. Fantasy! I would wear this dress, hands down. I love the futuristic silhouette and the crazy amount of sparkle. There are stars, there are birds, there are horses, there are horses that appear to have feathers on their heads (think Cinderella? ), and there’s a ferris wheel! It’s also tea length, which always seems to add a bit of whimsy. Maybe the word “tea” just makes me feel whimsical. But anyhow, paired with understated makeup, hair, and nails, Thandie looks incredible. This dress is a dream. I can typically predict what Sofia Vergara will wear on the red carpet: something body-con, perhaps sequined, probably in a solid jewel tone, floor length, with lots of diamonds. Don’t get me wrong, it’s a formula that you really can’t go wrong with. Sofia is maybe thee definition of va-va-voom, and her looks always complement that. However, it was fun to see her in a knee length dress that felt a bit more fresh and youthful than her go-to aesthetic. Plus, the styling is just so classic- a black tulle skirt with red lips and nails, coupled with a brilliant boustier and, of course, diamonds. Ever since Alessandro Michele took over Gucci at the beginning of 2015, the Italian fashion house has done lost its damned mind in the best way EVARRR. Anyone happen to keep up with the press tour for Suicide Squad? Remember Margot Robbie’s crazy sequined unicorn dress? Gucci. The dress she wore with the tiger on it? Gucci. 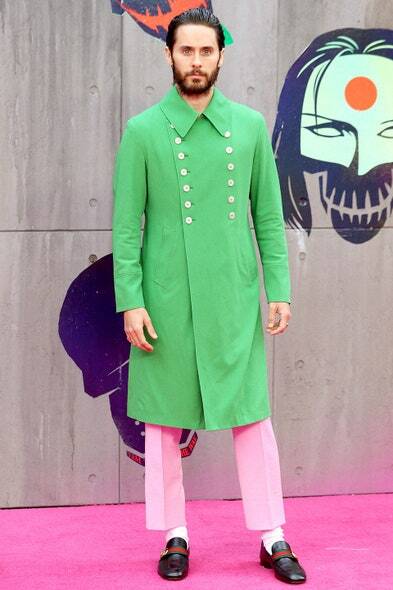 Jared Leto’s pink pants and kelly green coat that made him look like the captain of the Lollipop Guild? Gucci.